A few years back, I wrote or rambled on the nature of possession and the general state that society has tended towards over the course of the last century. Particularly, towards the materialistic and otherwise disposable mentality which fuels a socioeconomic bio mass with the primeval goal of devouring everything which can be consumed. Rather than returning to that conversation, I would rather turn towards a more productive (in the literal sense) approach to how life's default to restoration and refurbishment rather than replacement. Over the last few years as I have become surrounded with the shop, history, and culture of the 1850s and Westward Expansion that is prevalent in the shop wherein I work, a piece of the craft has become steadily more apparent to me. In the past, because the 'abundant material - time deficient' disparity was the controlling factor, I would abandon failed projects at the first sign of trouble and start again with a different approach. While the value of learning the trade under idealised circumstances cannot be overstated, there comes a price in that mistakes become an annoyance rather than a challenge. 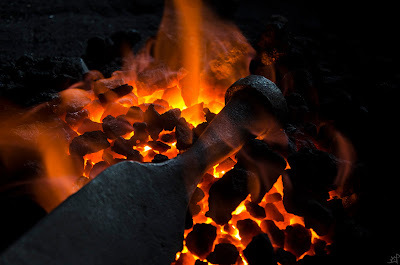 Now, examining the form of blacksmithing from a more historic and practical standpoint, those frivolous abandonings become less savoury. Perhaps the driving factor for beginning anew is the pursuit for perfection. If there are flaws, then perfection cannot be attained. If there are failures, then there will be flaws. If failures are not discarded, than there cannot be perfection. But things are not meant to be made perfect. By machines, perhaps. Where tolerances are within the tenth of a thousandth of a micron, perfection suddenly becomes more attainable. When a 1800 degree piece of metal is heated with a pile of coal and smitten with a hammer with tools that are ten times as old as the hands that form it, the metrics for accuracy are suddenly wholly relative and, to a certain extent in the technocratic industrialised world, irrelevant. When forging the above adze, it began as a body and an edge. Held together with a rivet so I might set the weld in the proper place, the chromium steel had trouble taking to the other half, but in the end it sufficed. Until the edge hot-shorted and crumbled apart. Once, I would have taken it as a sign to either start over with plain carbon steel or else abandon it entirely. But why waste the two days' work? Instead of scrapping the project, I welded a new edge to the lot, adding mass to the body by extending it to a half inch short of the eye. But then the neck became weakened by that transition, so I welded another short piece to span the gap between the eye and the new back plate. At this point, I changed the intention of the design and welded on a square piece to the centre from which I forged the central ridge. Two years ago I would never have thought this was possible, much less probable. By changing how I looked at possibility and shed the trepidation of attempting that which is beyond my former capability, I was able to grow into a better version of myself. In the simplest terms, it is the essence of progress. They say that necessity is the mother of invention. It may be better said that necessity is the catalyst for growth. Whether as a society or a culture or a trade or as an individual, by seeking the answer to problems rather than restarting them, we are able to find solutions to things which would once be impossible. When wages were the derivative of tools, care was put into those same tools that they would become worth the their cost. As a result, things were made to be used and to survive their use. When, after the inevitable failure of a hard won life, instead of being retired, where possible they were instead reforged. Restored. Repaired. And part of that cycle is born from the hands who made them. Where every farmer was and every town held a blacksmith, it was in that working knowledge as to fix tools before they were broken. That is to say, the function forced the form. Where there were weaknesses, where there were common failures, where there were susceptibilities and proneness, the maker made better. In forging a set of timber framing slicks, the two considerations I took above all others both related to the socket. First, an integral socket is something I have been trying to develop on a level of personal skill. 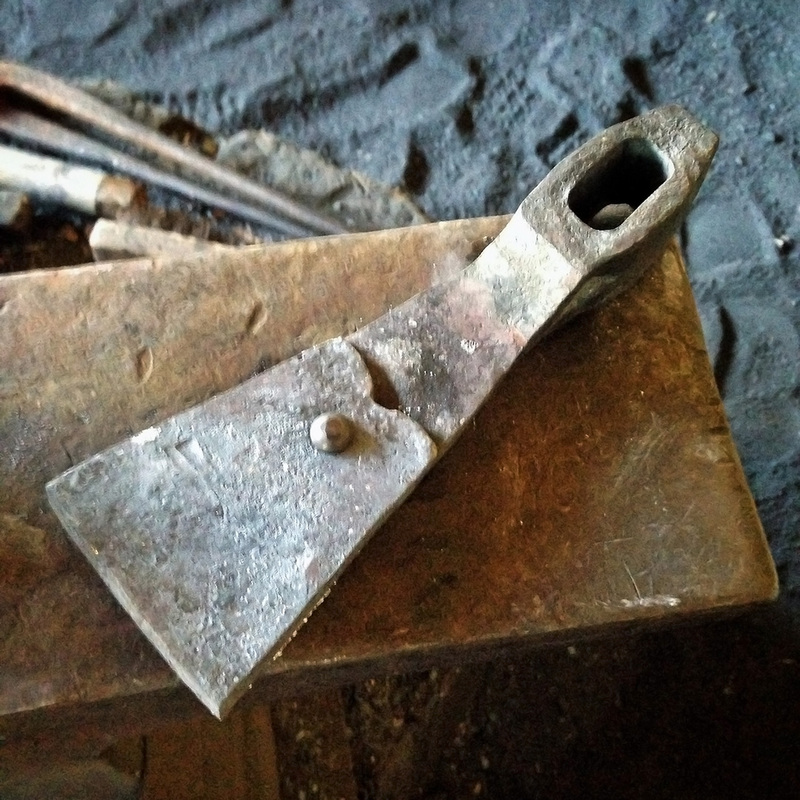 By having a socket rather than a tang, the handle is much better suited to the large scale hewing of framed joints. Second, the terminus of the socket. On the first iteration, I tried welding the socket to form an unbroken annulum. 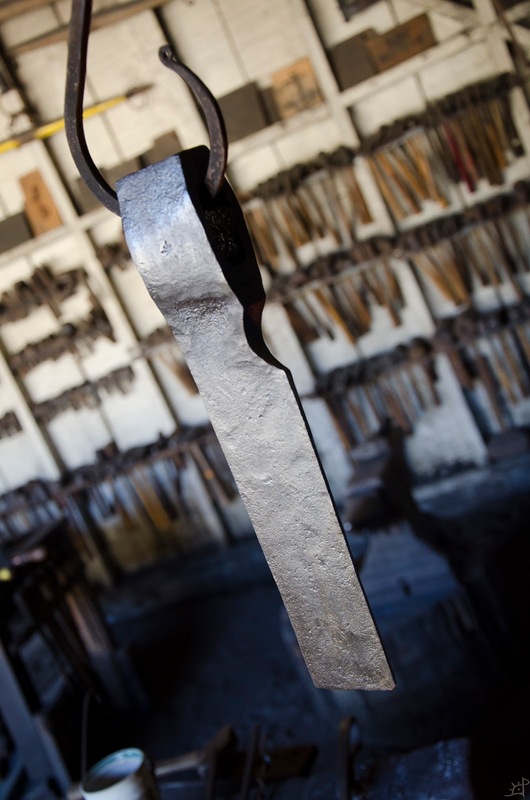 With the 5160 steel, the chromium prevented the feasibility of welding something so thin over so long a length. Driven by necessity, I decided to try welding on additional mass in the form of a collar to the top of the socket. This prevents the spring action of an un-welded socket from loosening a handle under heavy use. Aesthetic flaws are one of the more mundane problems I have come across, as they present no larger issue than pride in craftsmanship. None the less, I feel a certain drive in professionalism to correct what I might once have otherwise left untouched. Traditionally, the froe, an instrument for splitting logs into wedges or shingles or the general form of a smaller log, is forged by wrapping the eye around a mandrel and welding the seam. Because the blade is fairly thin, it does not make sense to forge it in an integral form to the eye. However, that wrapped eye method often leaves a harsh and unappealing transition between eye and blade. 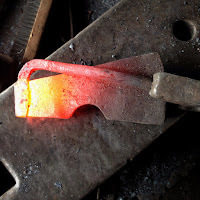 Taking the path less travelled, I decided to forge a froe from a piece of 2" square tool steel. In doing so, the first step was to slit and drift the eye. 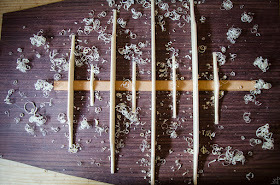 When working something so large by hand, there is inevitably some degree of uncertainty in alignment. 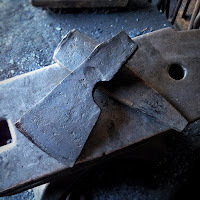 To counteract the deviation of the chisel as it passes through the steel, I cut from both sides and took the loss in the middle where the asymmetry is easiest forged out. However, lateral alignment is a slightly different problem. There was about a quarter inch offset between the top and bottom holes, leaving a slit in one side which extended half way through the steel. Because it is extremely difficult to correct that once the eye is fully cut, that small gap (yet visible on the heel end where left uncorrected) will either remain in the finished piece or else need to be re-cut all the way through. For no other reason than to see if I could, I took a small bit of scrap mild steel, forged it into a plug, and welded it into the hole. Using the drift as a press, I drove it in and hammered to create an outward pressure on the plug which set the weld. Subsequent downward pressure forged it mostly flat, leaving behind the relatively smooth transition seen above. As I examine a greater volume of historic work, the more I realise that this sort of fix is not only done but done commonly. 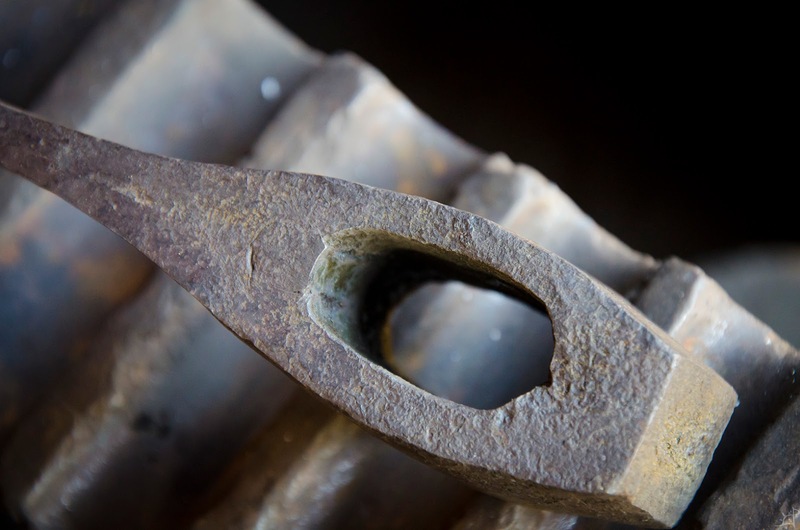 Lap welding on new edges to tools, refacing hammers or anvils, fixing cracks with another band of iron welded over the failure, it was as common then as we now use tape or glue. When those flaws are less aesthetic and more accurately a detriment to structural integrity, I find that the means of salvaging the already-expended-effort is largely the same. Over a year ago, I began forging the body of a carving axe. When slitting the eye, I cut just slightly too close to the back end of the stock and assumed that it would fail while forging the eye. Indeed, it might have been for the size of haft needed for this sort of axe. Then, while sorting through projects to finish, I found it again and took a closer look at what it would take to fix. Indeed, a hundred fifty years ago, this sort of thing would be worth too much to discard. The thin spot was, fortunately, confined to one side of the eye. As I drifted the eye open, a convenient corner formed that looked as though it would nicely take a spare bit of steel for reinforcement. 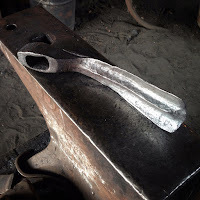 Without modern welding equipment, the only way to hold onto the bit to be welded was a tricky bit of thinking through the problem and a different pair of tongs. This is, surprisingly, the first (and probably only) time where box jaw tongs worked absolutely perfectly for the job. In the end, there was only a slight seam left over from the weld due in part to leaving all the scale on both pieces of metal prior to welding. As it were, I learned a valuable lesson in the same school of thought. 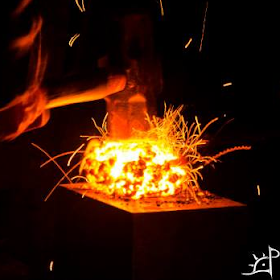 For blacksmiths are the ultimate manipulators of form, and for all the limitations of working with a hammer and a 3000 degree fire, those same vices become advantages by opening a world of possibility unique to the trade. 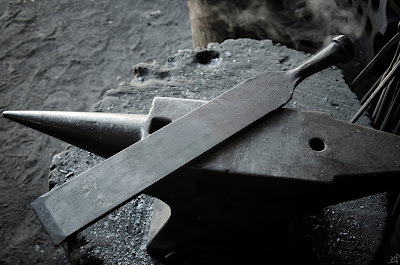 Through the last eight years since I first struck iron, the constant evolution of thought and conspiratory approach towards problem solving has taught me more than I would have ever imagined, and I suspect that I have only scratched the surface. 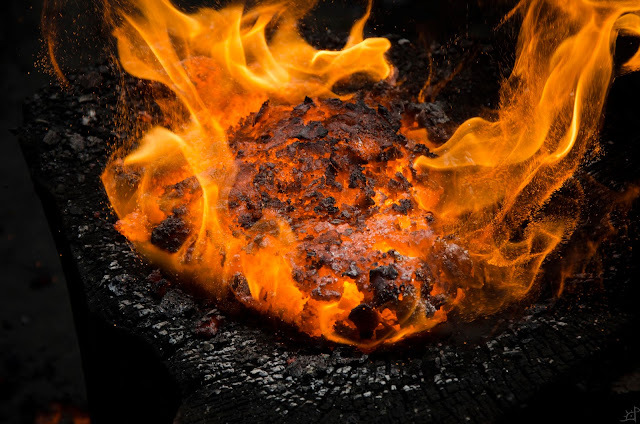 In all things, not least being the art of forging, I have come to learn that there is always another way through a problem seemingly bereft of solution.